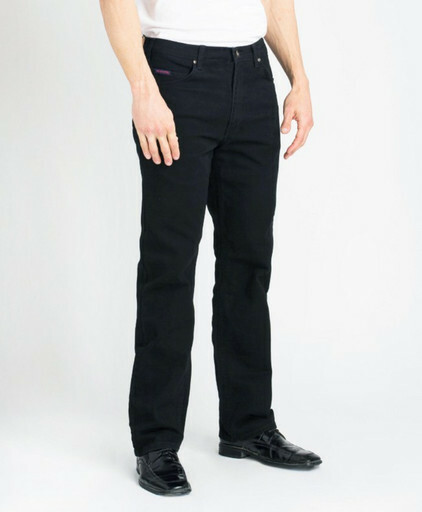 183 Black Stretch Jean - Black - Workwear Deals - GRAND RIVER Black Stretch Jean, # 183, 5 Pocket Stretch Jean, 98% Premium Cotton Twill and 2% Spandex Comfort Stretch Fabric, Big & Tall, GRAND RIVER Stretch Jeans, formerly RIVER ROAD Stretch Jeans. These Black Stretch Jeans, with their Deep Solid Black Color, give you a Clean Cut Look with an 'Air of Distinction'. Combine with a button down shirt and a great jacket and you're ready for nearly any occasion. These Traditional Fit, Five Pocket Stretch Jeans are made from 98% Premium Cotton Twill and 2% Spandex for Style and Comfort that can hold up at work or out on the town!